The Old Sugar Mill, just a few miles outside of Sacramento California, is open 7 days a week. It’s a destination location that houses eleven Northern California wineries from 7 different wine regions. In addition to Carvalho Family Winery, these are the wineries you will find there: Draconis Vineyards, Todd Taylor, Three Wine Company, Heringer Estates Family Vineyards & Winery, Elevation Ten, Rendez-vous Winery, Merlo Family Vineyards, Clarksburg Wine Company, Due Vigne di Famiglia, and Perry Creek Vineyards. All these wineries offer their best selection of wines for tasting and to purchase. Carvalho Family Winery follows a tradition that started in Portugal many years ago. They have continued that tradition as an ultra-premium winery in the Clarksburg Wine Region by dedicating their efforts in producing small-lot, handcrafted California wines. They do this by using the very best grapes from the surrounding Clarksburg vineyards as well as other vineyards throughout California. They accomplished stunning results by using old world winemaking practices along with the best viticulture tools and techniques available today. Story: Five Barrel is comprised of 5 Portuguese varietals (5 barrels). Aromas: Fig, maple, dried fruit. Flavors: Fig, caramel, toasted hazelnut, raisin. Food Match: Great for after dinner or try with vanilla bean ice cream or chocolate. You can find Carvalho Family Winery Five Barrel Tawny Port on their website or in their tasting room at The Old Sugar Mill. 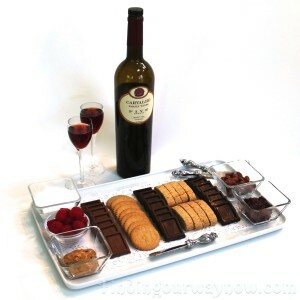 This port wine truly was a perfect compliment to my “Chocolate Tasting Board.” In addition to that, The Old Sugar Mill location is an ideal location to spend a bit of time for any kind of wine lover. It offers fun events and many new wines and winery discoveries such as this Carvalho Family Winery Five Barrel Tawny Port. If you enjoyed reading about “Carvalho Family Winery Five Barrel Tawny Port,” check out Croft Tawny Port, Ficklin Vineyards 10 Year Tawny Port, and Taylor Fladgate 10 Year Tawny Port.